Thousands of books smoulder in a huge bonfire as Germans give the Nazi salute during the wave of book-burnings that spread throughout Germany. Book burning is the ritual destruction by fire of books or other written materials, usually carried out in a public context. 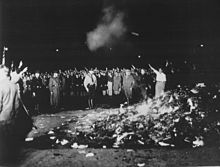 The burning of books represents an element of censorship and usually proceeds from a cultural, religious, or political opposition to the materials in question. In some cases, the destroyed works are irreplaceable and their burning constitutes a severe loss to cultural heritage. Examples include the burning of books and burying of scholars under China's Qin Dynasty (213–210 BCE), the burning of the Library of Alexandria (c. 49), the obliteration of the Library of Baghdad (1258), the destruction of Aztec codices by Itzcoatl (1430s), and the burning of Maya codices on the order of bishop Diego de Landa (1562). In other cases, such as the Nazi book burnings, other copies of the destroyed books survive, but the instance of book burning becomes emblematic of a harsh and oppressive regime which is seeking to censor or silence an aspect of a nation's culture. Book burning can be an act of contempt for the book's contents or author, and the act is intended to draw wider public attention to this opinion. Examples include the burning of Wilhelm Reich's books by the FDA and the 2010 Qur'an-burning controversy. Art destruction is related to book burning, both because it might have similar cultural, religious, or political connotations, and because in various historical cases books and artworks were destroyed at the same time. In modern times, other forms of media, such as phonograph records, video tapes, and CDs have also been burned, shredded, or crushed. When the burning is widespread and systematic, destruction of books and media can become a significant component of cultural genocide. The burning of books has a long history as a tool wielded by authorities both secular and religious, in efforts to suppress dissenting or heretical views that are perceived as posing a threat to the prevailing order. According to the Tanakh (Hebrew Bible), in the 7th century BCE King Jehoiakim of Judah burned part of a scroll Baruch ben Neriah had written at prophet Jeremiah's dictation (Jeremiah 36). 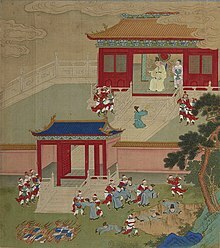 Killing the Scholars and Burning the Books in 210-213 BC (18th century Chinese painting). Qin Shi Huang, first emperor of Qin Dynasty, ordered a Burning of books and burying of scholars in 213 BCE and burial alive of 460 Confucian scholars in 210 BCE in order to stay in the throne. Some of these books were written in Shang Xiang, a superior school founded in 2208 BCE. The event caused the loss of many philosophical treatises of the Hundred Schools of Thought. The official philosophy of government ("legalism") survived. In New Testament's Acts of the Apostles, it is claimed that Paul performed an exorcism in Ephesus. After men in Ephesus failed to perform the same feat many gave up their "curious arts" and burned the books because apparently they didn't work. And many that believed, came and confessed and shewed their deeds. Many of them also which used curious arts, brought their books together, and burned them before all men: and they counted the price of them, and found it fifty thousand pieces of silver. "In addition, if any writing composed by Arius should be found, it should be handed over to the flames, so that not only will the wickedness of his teaching be obliterated, but nothing will be left even to remind anyone of him. And I hereby make a public order, that if someone should be discovered to have hidden a writing composed by Arius, and not to have immediately brought it forward and destroyed it by fire, his penalty shall be death. As soon as he is discovered in this offense, he shall be submitted for capital punishment....."
According to Elaine Pagels, "In AD 367, Athanasius, the zealous bishop of Alexandria... issued an Easter letter in which he demanded that Egyptian monks destroy all such unacceptable writings, except for those he specifically listed as 'acceptable' even 'canonical'—a list that constitutes the present 'New Testament'". (Pagels cites Athanasius's Paschal letter (letter 39) for 367 CE, which prescribes a canon but does not explicitly order monks to destroy excluded works.) Heretical texts do not turn up as palimpsests, scraped clean and overwritten, as do many texts of Classical antiquity. According to author Rebecca Knuth, multitudes of early Christian texts have been as thoroughly "destroyed" as if they had been publicly burnt. Emperor Aurelian's (270–275 CE) sack of Alexandria in 272 CE, which badly damaged the section of the city which housed part of the library. Supposedly (but incorrectly) the religious riots aimed against pagan temples and their rituals in 391 CE, sanctioned by decree of Emperor Theodosius I and led by Coptic Pope Theophilus. Activity by Cyril of Alexandria (c. 376–444) brought fire to almost all the writings of Nestorius (386-450) shortly after 435. 'The writings of Nestorius were originally very numerous', however, they were not part of the Nestorian or Oriental theological curriculum until the mid-sixth century, unlike those of his teacher Theodore of Mopsuestia, and those of Diodorus of Tarsus, even then they were not key texts, so relatively few survive intact, cf. Baum, Wilhelm and Dietmar W. Winkler. 2003. The Church of the East: A Concise History. London: Routledge. According to the Chronicle of Fredegar, Recared, King of the Visigoths (reigned 586–601) and first Catholic king of Spain, following his conversion to Catholicism in 587, ordered that all Arian books should be collected and burned; and all the books of Arian theology were reduced to ashes, along with the house in which they had been purposely collected. Which facts demonstrate that Constantine's edict on Arian works was not rigorously observed, as Arian writings or the theology based on them survived to be burned much later in Spain. In 1244, as an outcome of the Disputation of Paris, twenty-four carriage loads of Talmuds and other Jewish religious manuscripts were set on fire by French law officers in the streets of Paris. During the conquest of the Americas and in the aftermath of the encounter between European and indigenous American civilizations, many books written by indigenous peoples were destroyed. There were many[quantify] books written by the Aztecs in existence at the time of the Spanish conquest of Yucatán in the 16th century. However, most were destroyed by the Conquistadors and the Catholic priests, with the exception of the work of the priest Bartolome de la Casas. In particular, many books in Yucatán were ordered destroyed by Bishop Diego de Landa in July 1562. De Landa wrote: "We found a large number of books in these characters and, as they contained nothing in which were not to be seen as superstition and lies of the devil, we burned them all, which they (the Maya) regretted to an amazing degree, and which caused them much affliction." Ironically, most of the books that were destroyed by the Europeans were biased and based upon the Aztec people's version of the history of the region. The Aztecs had previously conquered the area and destroyed many of the Mayan books and documents. The Library of Congress was founded in 1800, 24 years after the United States gained its independence from the Kingdom of Great Britain. In 1814, 3,000 books from the Library of Congress were used by the British forces to burn down the US Capitol during the Burning of Washington. Although there were dissenting voices to this wanton destruction, the conflagration was motivated by a strong desire on the part of the British to humiliate the Americans. 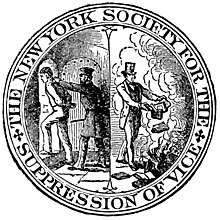 Anthony Comstock's New York Society for the Suppression of Vice, founded in 1873, inscribed book burning on its seal, as a worthy goal to be achieved. Comstock's total accomplishment in a long and influential career is estimated to have been the destruction of some 15 tons of books, 284,000 pounds of plates for printing such 'objectionable' books, and nearly 4,000,000 pictures. All of this material was defined as "lewd" by Comstock's very broad definition of the term—which he and his associates successfully lobbied the United States Congress to incorporate in the Comstock Law. In 1588, the exiled English Catholic William Cardinal Allen wrote "An Admonition to the Nobility and People of England", a work sharply attacking Queen Elizabeth I. It was to be published in Spanish-occupied England in the event of the Spanish Armada succeeding in its invasion. Upon the defeat of the Armada, Allen carefully consigned his publication to the fire, and it is only known of through one of Elizabeth's spies, who had stolen a copy. The Hassidic Rabbi Nachman of Breslov is reported to have written a book which he himself burned in 1808. To this day, his followers mourn "The Burned Book" and seek in their Rabbi's surviving writings for clues as to what the lost volume contained and why it was destroyed. Carlo Goldoni is known to have burned his first play, a tragedy called Amalasunta, when encountering unfavorable criticism. Nikolai Gogol burned the second half of his magnum opus Dead Souls, having come under the influence of a priest who persuaded him that his work was sinful; Gogol later described this as a mistake. As noted in Claire Tomalin's intensively researched "The Invisible Woman", Charles Dickens is known to have made a big bonfire of his letters and private papers, as well as asking friends and aquintances to either return letters which he wrote to them or themselves destroy the letters - and most complied with his request. Dickens' purpose was to destroy evidence of his affair with the actress Nelly Ternan. To judge from surviving Dickens letters, the destroyed material - even if not inteded for publication - might have had considerable literary merit. In the 1870s Tchaikovsky destroyed the manuscript full score of his first opera, The Voyevoda. During the Soviet period The Voyevoda was posthumously reconstructed from surviving orchestral and vocal parts and the composer's sketches. After Hector Hugh Munro (better known by the pen name Saki) was killed in World War I in November 1916, his sister Ethel destroyed most of his papers. Joe Shuster, who together with Jerry Siegel created the fictional superhero Superman, in 1938 burned the first Superman story when under the impression that it would not find a publisher. In Catholic hagiography, Saint Vincent of Saragossa is mentioned as having been offered his life on condition that he consign Scripture to the fire; he refused and was martyred. He is often depicted holding the book which he protected with his life. Another book-saving Catholic Saint is the Tenth Century Saint Wiborada. She is credited with having predicted in 925 an invasion of the then Pagan Hungarians of her region in Switzerland. Her warning allowed the priests and religious of St. Gall and St. Magnus to hide their books and wine and escape into caves in nearby hills. Wiborada herself refused to escape and was killed by the marauders, being later canonized. In art, she is commonly represented holding a book to signify the library she saved, and is considered a patron saint of libraries and librarians. During a tour of Thuringia in 1525, Martin Luther became enraged at the widespread burning of libraries along with other buildings during the German Peasants' War, writing Against the Murderous, Thieving Hordes of Peasants in response. At the beginning of the Battle of Monte Cassino in the World War II, two German officers - Viennese-born Lt. Col. Julius Schlegel (a Roman Catholic) and Captain Maximilian Becker (a Protestant) - had the foresight to transfer the Monte Cassino archives to the Vatican. Otherwise the archives - containing a vast number of documents relating to the 1500-years' history of the Abbey as well as some 1,400 irreplaceable manuscript codices, chiefly patristic and historical - would have been destroyed in the Allied air bombing which almost completely destroyed the Abbey shortly afterwards. Also saved by the two officers' prompt action were the collections of the Keats-Shelley Memorial House in Rome which had been sent to the Abbey for safety in December 1942. The Sarajevo Haggadah - one of the oldest and most valuable Jewish illustrated manuscripts, with immense historical and cultural value - was hidden from the Nazis and their Ustashe collaborators by Derviš Korkut, chief librarian of the National Museum in Sarajevo. At risk to his own life, Korkut smuggled the Haggadah out of Sarajevo and gave it for safekeeping to a Muslim cleric in Zenica, where it was hidden until the end of the war under the floorboards of either a mosque or a Muslim home. The Haggadah again survived destruction during the wars which followed the breakup of Yugoslavia. In 1940's France, a group of anti-fascist exiles created a Library of Burned Books which housed all the books that Adolf Hitler had destroyed. This library contained copies of titles that were burned. These book burnings from the Nazis was an idea to help cleanse German culture of Jewish and foreign influences such as pacifist and decadent literature. The Nazis were going to make a "museum" of Judaism once the Final Solution was complete to house certain books that were saved by the Nazis themselves. When Virgil died, he left instructions that his manuscript of the Aeneid was to be burnt, as it was a draft version with uncorrected faults and not a final version for release. However, this instruction was ignored. It is mainly to the Aeneid, published in this "imperfect" form, that Virgil owes his lasting fame – and it is considered one of the great masterpieces of classical literature as a whole. Before his death, Franz Kafka wrote to his friend and literary executor Max Brod: "Dearest Max, my last request: Everything I leave behind me... in the way of diaries, manuscripts, letters (my own and others'), sketches, and so on, [is] to be burned unread." Brod overrode Kafka's wishes, believing that Kafka had given these directions to him, specifically, because Kafka knew he would not honour them – Brod had told him as much. Had Brod carried out Kafka's instructions, virtually the whole of Kafka's work – except for a few short stories published in his lifetime – would have been lost forever. Most critics, at the time and up to the present, justify Brod's decision. A similar case concerns the noted American poet Emily Dickinson, who died in 1886 and left to her sister Lavinia the instruction of burning all her papers. Lavinia Dickinson did burn almost all of her sister's correspondences, but interpreted the will as not including the forty notebooks and loose sheets, all filled with almost 1800 poems; these Lavinia saved and began to publish the poems that year. Had Lavinia Dickinson been more strict in carrying out her sister's will, all but a small handful of Emily Dickinson's poetic work would have been lost. Biblioclasm still occurs. All over the world schools and libraries have been destroyed in recent years. Despite the act of destroying books being condemned by the majority of society, people still participate on small and/or large scale. In Azerbaijan, when a modified Latin alphabet was adopted, books published in Arabic script were burned, especially in the late 1920s and 1930s. The texts were not limited to the Quran; medical and historical manuscripts were also destroyed. Book burning in Chile following the 1973 coup that installed the Pinochet dictatorship in Chile. Book burnings were organised regularly in Nazi Germany in the 1930s by stormtroopers to destroy degenerate works, especially by Jewish authors such as Thomas Mann, Marcel Proust and Karl Marx. During denazification following the war, literature confiscated by the Allies was reduced to pulp instead of burning. In the 1950s, over six tons of books by William Reich were burned in the U.S. under judicial orders. In Denmark, a comic book burning took place 23 June 1955. It was a bonfire consisting of comic books and on top of that a life size cardboard cutout of The Phantom. Kjell Ludvik Kvavik, a senior Norwegian official, had a penchant for removing maps and other pages from rare books and was noticed in January 1983 by a young college student. The student, Barbro Andenaes, reported the actions of the senior official to the superintendent of the reading room and then to the head librarian of the university library in Oslo. Hesitant to make public something that would greatly hurt the career of Kvavik even if the accusation proved false, media kept the name of the perpetrator quiet until his house was searched by police. The authorities seized 470 maps and prints as well as 112 books that Kvavik had illegally obtained. While this may not be the large scale, violent demonstration seen during wars, Kvavik's disregard for libraries and books shows that destruction of books on any scale can affect an entire country. Here, a senior official in the Norwegian government was disgraced and the University Library was refunded only a small portion of the costs it incurred from the loss and destruction of rare materials as well as the security changes that had to be made. In this case, the draw of personal profit and enhancing one's own collection was the cause of the defacement of rare books and maps. While the main goal was not destruction for destruction's sake, the resulting damage to the ephemera still carries weight within the library community. In 1984, Amsterdam's South African Institute was infiltrated by an organized group bent on drawing attention to the inequality of the apartheid. Well-organized and ensuring patrons of the library that no harm would come to them, group members systematically smashed microfiche machines and threw books into the nearby waterway. Indiscriminate of the content being destroyed, shelf after shelf was cleared of its contents until the group left. Staff members fished books from the water in hopes of salvaging the rare editions of travel books, documents about the Boer Wars, and contemporary materials both for and against apartheid. Many were destroyed by oil, ink, and paint that the anti-apartheid demonstrators had flung around the library. The world was outraged at the loss of knowledge that these demonstrators had caused, and instead of winning support and getting attention on the issue of apartheid, the international audience cried out against the actions at the Amsterdam's South African Institute. Some demonstrators came forward to explain that they believed the institute was pro-apartheid and that nothing was being done to change the status quo in South Africa. Logo from the defunct kreuz.net website, which was listed in the Index of Harmful Materials in Germany and shut down when the webmaster was arrested and the supporting hardware was confiscated in Austria. The subtitle translates as "catholic news." The advent of the digital age has resulted in an immense collection of written work being catalogued exclusively or primarily in digital form. The intentional deletion or removal of these works has been often referred to as a new form of book burning. Some supporters have celebrated book burning cases in art and other media. Such is the bas-relief by Giovanni Battista Maini of The Burning of Heretical Books over a side door on the façade of Santa Maria Maggiore, Rome, which depicts the burning of 'heretical' books as a triumph of righteousness. During the years of the Chilean fascist military dictatorship under Augusto Pinochet (1973–1990), hundreds of books were burned as a way of repression and censorship of leftist literature. In some instances, even books on Cubism were burned because soldiers thought it had to do with the Cuban Revolution. A similar incident also occurred in Mullumbimby, New South Wales, Australia in 2009. Reported as "just like the ritual burning of books in Nazi Germany", a book-burning ceremony was held by students of the "socially harmful cult" Universal Medicine, an esoteric healing business owned by Serge Benhayon. Students were invited to throw their books onto the pyre. Most of the volumes were on Chinese medicine, kinesiology, acupuncture, homeopathy and other alternative healing modalities, all of which Benhayon has decreed evil or "prana". In 1981, the Jaffna Public Library in Jaffna, Sri Lanka was burned down by Sinhalese police and paramilitaries during a pogrom against the minority Tamil population. At the time of its burning it contained almost 100,000 Tamil books and rare documents. It is estimated that during 1990s in Croatia over 2,8 million books were destroyed by the Croatian government. Those were the books written in Cyrillic, written in Ekavian version of Serbo-Croatian, written by the Serbs or by "unsuitable" Croats. In the Sikh religion, any copies of their sacred Guru, Guru Granth Sahib which are too badly damaged to be used, and any printer's waste which bears any of its text, are cremated. Such a cremation is called Agan Bhet, and is similar to that performed when cremating a deceased Sikh. In his 1821 play, Almansor, the German writer Heinrich Heine—referring to the burning of the Muslim holy book, the Qur'an, during the Spanish Inquisition—wrote, "Where they burn books, so too will they in the end burn human beings." ("Dort, wo man Bücher verbrennt, verbrennt man auch am Ende Menschen.") Over a century later, Heine's own books were among the thousands of volumes that were torched by the Nazis in Berlin's Opernplatz, even while his poem Die Lorelei continued to be printed in German schoolbooks as "by an unknown author". In Ray Bradbury's Fahrenheit 451, the book deals with the concept of censorship via burning books. It is said that Bradbury wrote the book due to his concerns of literature being burned in America during the McCarthy era and as well, fearing that mass media (television especially) reduce the interest in reading books. The Japanese light novel series Library War (図書館戦争, Toshokan Sensō), by Hiro Arikawa, describes how an armed Library Defence Force protects libraries from censorship after a lethal attack at library. It was later adapted into a manga, a 12-episode anime, internet radio shows, live action films and a special TV episode. ^ "Holocaust Encyclopedia: Book Burning". ^ Edict by Emperor Constantine against the Arians. Athanasius (23 January 2010). "Edict by Emperor Constantine against the Arians". Fourth Century Christianity. Wisconsin Lutheran College. Archived from the original on 19 August 2011. Retrieved 2 May 2012. ^ Elaine Pagels, Beyond Belief: The Secret Gospel of Thomas (Random House, 2003), n.p. ^ "NPNF2-04. Athanasius: Select Works and Letters". Ccel.org. 13 July 2005. Retrieved 21 January 2012. ^ Knuth, R. (2006). Burning books and leveling libraries, p. 13. Praeger, London. ISBN 0275990079. ^ Phillips, Heather (2010). "The Great Library of Alexandria?". Library Philosophy and Practice. Retrieved 3 April 2017. ^ Heather Phillips (2010). "The Great Library of Alexandria?". Library Philosophy and Practice. ^ "The Monks of Kublai Khan". Aina.org. Retrieved 15 December 2017. ^ Chapman, John. "Nestorius and Nestorianism". New Advent. The Catholic Encyclopedia. New York: Robert Appleton Company. Retrieved 25 January 2018. ^ Duncan McMillan, Wolfgang van Emden, Philip E. Bennett, Alexander Kerr, Société Rencesvals, Guillaume d'Orange and the chanson de geste: essays presented to Duncan McMillan in celebration of his seventieth birthday by his friends and colleagues of the Société Rencesvals, University of Reading, 1984. ^ Edward Gibbon, The History of the Decline and Fall of the Roman Empire, 1776–89. ^ Murray, Stuart (2009). The Library: An Illustrated History. Chicago, IL: Skyhorse Publishin. p. 158. ISBN 9781616084530. ^ Catholic encyclopedia, "Spanish Armada". ^ "עכותור - מדריכי טיולים לעיר עכו ולכל הארץ | מדריך טיולים | מסלולי טיול לקבוצות עברית + צרפתית". Acco-tour.50webs.com. Retrieved 21 January 2012. ^ O'Donnell, Jim (20 November 2003). "Patron saints". liblicense-l@lists.yale.edu (Mailing list). Georgetown University. Retrieved 2 May 2007. ^ Jaroslav J. Pelikan, Hilton C. Oswald, Luther's Works, 55 vols. (St. Louis and Philadelphia: Concordia Pub. House and Fortress Press, 1955–1986), 46: 50–51. ^ Brooks, Geraldine (3 December 2007). "The Book of Exodus: A Double Rescue in Wartime Sarajevo" (PDF). The New Yorker. Retrieved 31 March 2012. ^ Lyons, Martyn (2011). Books:A Living History. Los Angeles: J.Paul Getty Museum. pp. 200–201. ISBN 9781606060834. ^ Quoted in Publisher's Note to The Castle, Schocken Books. ^ Habegger, Alfred (2001). My Wars Are Laid Away in Books: The Life of Emily Dickinson. p. 604. ^ Aziza Jafarzade, "Memoirs of 1937: Burning Our Books, The Arabic Script Goes Up in Flames," in Azerbaijan International, Vol. 14:1 (Spring 2006), pp. 24-25. ^ Asaf Rustamov, "The Day They Burned Our Books," in Azerbaijan International, Vol. 7:3 (Autumn 1999), pp. 74-75. ^ "Fantomet på bålet 1955". Danmarkshistorien.dk. 9 April 1940. Retrieved 15 December 2017. ^ Thomas, Lawrence. "Biblioclasm in Norway". Library and Archival Security 6. (1984): 13-16. ^ Knuth, Rebecca. Burning Books and Leveling Libraries. Westport, Connecticut: Praeger, 2006. ^ German wikipedia article on kreuz.net and archived version of kreuz.net. ^ Ruggiero, Lucia. (n.d.). 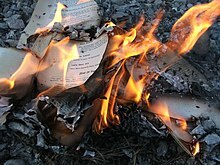 Digital books; could they make censorship and "book burning" easier? Digital Meets Culture. Retrieved 22 October 2015, from http://www.digitalmeetsculture.net/article/digital-books-could-they-make-censorship-and-book-burning-easier/ See also Deletionism and inclusionism in Wikipedia for information about this phenomenon on Wikipedia. ^ Noted in Touring Club Italiano, Roma e Dintorni 1965:344. ^ Bosmajian, Haig (2006). Burning Books. Jefferson, North Carolina: McFarland & Company, Inc. p. 141. ISBN 0786422084. ^ "The books have been burning - World - CBC News". Cbc.ca. Retrieved 15 December 2017. ^ Edwards, Jorge. "Books in Chile," Index on Censorship nº 2, 1984, pp. 20—23. ^ Andrain, Charles. Political Change in the Third World, 2011, p. 186. ^ Whitbourn, Michaela (15 October 2018). "Self-styled healer Serge Benhayon leads 'socially harmful cult': jury". Sydney Morning Herald. Fairfax Media. ^ Leser, David (25 August 2012). "The Da Vinci Mode". Sydney Morning Herald. Retrieved 5 January 2015. ^ Knuth, Rebecca. Burning Books and Leveling Libraries: Extremist Violence and Cultural Destruction. Praeger Publishers, 2006, p. 84. ^ "Presss Release BC Sikh Community" (PDF). Harjas.com. Archived from the original (PDF) on 15 June 2007. ^ "4 copies damaged in New Orleans by the flood caused by Hurricane Katrina". Sikhnn.com. Archived from the original on 7 October 2007. ^ "on the Nicobar Islands after the 2004 tsunami (end of page)". unitedsikhs.org. ^ "Blog query about an accumulation of download printouts of Sikh sacred text". Mrsikhnet.com. Archived from the original on 10 January 2008. ^ Henley, Jon (10 September 2010). "Book-burning: fanning the flames of hatred". The Guardian. Retrieved 25 December 2012. Knuth, Rebecca (2006). Burning Books and Leveling Libraries: Extremist violence and Cultural Destruction. Westport, Connecticut: Praeger. Plastron, Lucien X. 2007. Books on Fire: The Destruction of Libraries throughout History. Rochester, VT: Inner Traditions.